Ryobi recently released two battery powered inverters that ran off of their 40V batteries however many Ryobi users don’t have 40V batteries but instead use 18V batteries so they were out of luck if they wanted an inverter powered by their batteries. 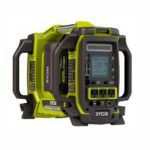 Luckily for us Ryobi just announced a new inverter powered by the widely popular 18 volt Ryobi One+ batteries with the Ryobi RYi150BG 18V 150 Watt Powered Inverter Generator. 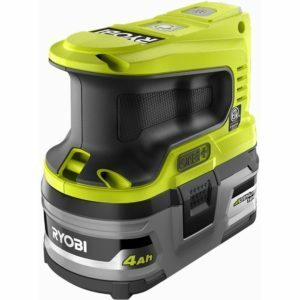 The new Ryobi RYi150BG 18V 150 Watt Powered Inverter Generator isn’t technically a generator as it doesn’t run on gas and doesn’t generate energy since the installed battery is what provides energy but it’s still a great concept since it’s basically an inverter that can power low power household electronics like flatscreen TV’s and laptops via the inverter’s built in single 150 watt (1.25 amp) AC port. 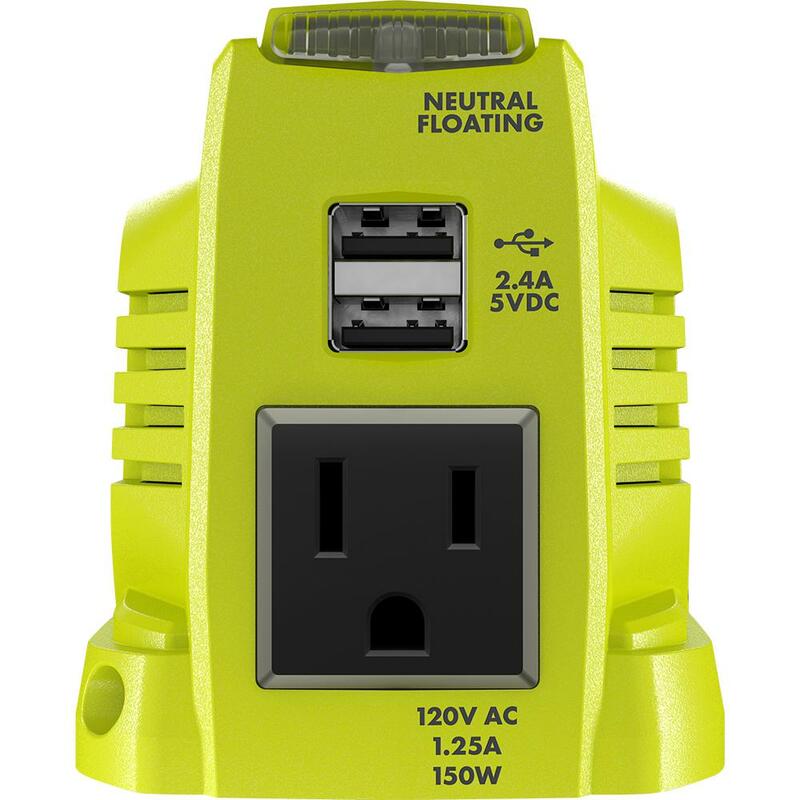 It also has a couple of USB ports (2.4 amp) for plugging and charger your mobile devices on the go. 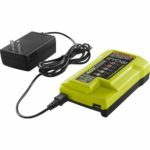 So this inverter basically makes your Ryobi 18V batteries a portable power station also known as a portable power supply. There’s also an onboard LED light which might be useful as a light duty flashlight in a pinch however I don’t expect it to be very bright and also because Ryobi didn’t mention how bright it was in lumens. 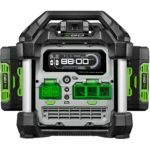 This was spotted on the HD site and quickly was pulled but we do know it will come out some time “soon” and will be priced at $79.97 as a baretool. A big thanks to DrewBHAM and Joshua B. for spotting! Nice idea, at first I got excited,but it’s pretty much useless. It’s AC out 1.25A using a 10A socket. Power banks are smaller and cheaper. I was hoping for something similar to the 6-port charger with at least 11A (1300+W). That would have got me to invest into more batteries. Honestly, for that MSRP at those low specs, you may as well outright buy cordless. Mind, I know there’s some items that don’t have usb charge, but still doesn’t justify it being this low spec. I wouldn’t be surprised if they came out with a multi-battery version. Seems like a great way to sell batteries. This low powered version could be the gateway drug for the Home Depot crowd who may not look into other options. 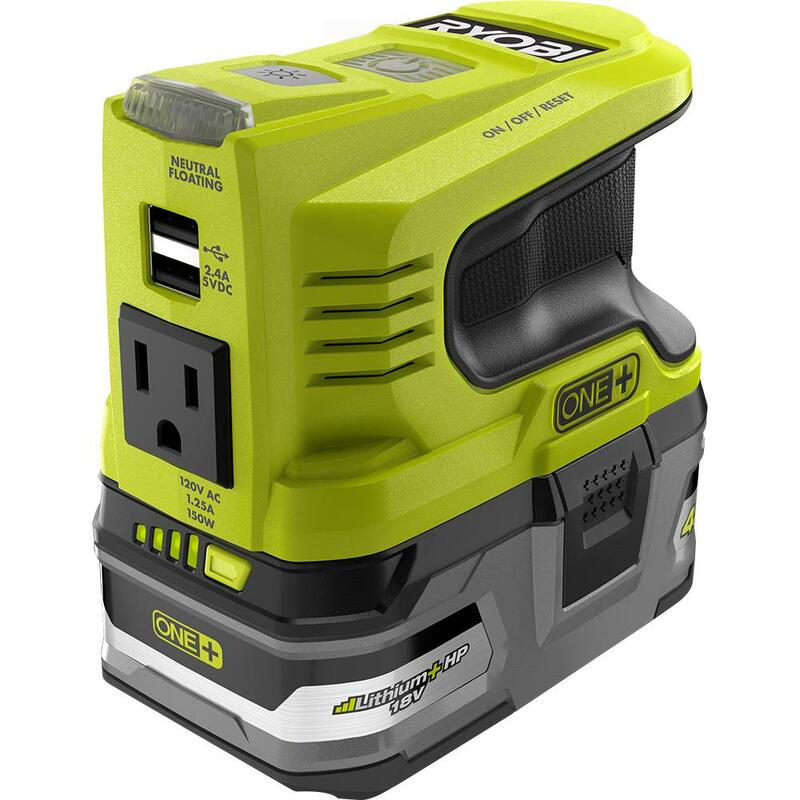 I’m eyeing the 300W version that works with their 40V batteries since I have several of those. I see many uses for this. Far from useless. I will get this once it comes out. Also the output is not true sine wave. 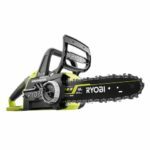 This listing finally showed back up on the Home Depot site. This time is even has reviews and pictures from the reviews.